'twas three days before christmas. others were already out there chucking the fly. 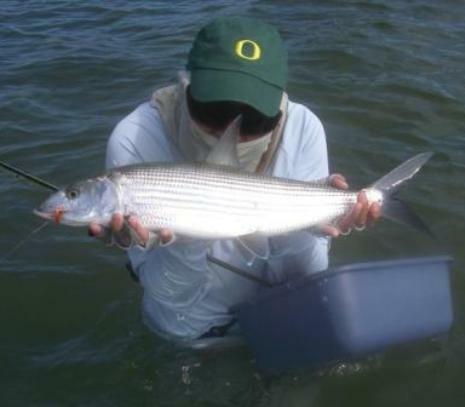 all with the same twisted intentions as i.
of how to fool bonefish with feathers and then let them go. that the glare on the water would make it impossible to see. waded out into the fracus to start the winter bombing day. when from my left side i heard such a shout. i glanced over to see what doug was whining about... (this time). his rod was bent over a familiar sight. dougy had hooked up and beat me to this day�s first bite. but it gave us a clue, �there�s fish around!�. that bumping is something that rats often do. just as i expected the bump came again. this bones gonna take it, it was just a matter of when. call it a player, an eater, a sucker. i knew it was on my fly, �c�mon eat it you fucker�. a solid strip set and away that bone tore. by the backing it peeled out and the way that it fought. for the first one of six, not bad, on such a winters day. but when you hang with nwff, it�s never about keeping the score. it�s all about friends horsing around, laughing, and playing with gear. add water and fish and you can have christmas all year! and as we called it a day and rolled off the flat. merry christmas to all the peeps and pounders out there from clay, sean, and e.t. but sometimes you gotta do what you gotta do on the quest for... good times. so tfo (temple fork outfitters) has apparently thrown their hat into the ultra high performance rod market with the release of the bvk (which apparently stands for bernard victor kreh). the folks at tfo just forgot to put an ultra high performance price on it. the bvk retails for two hundred twenty five to two hundred fifty bucks and are available in 3 to 10wt. these rods are quite possibly lefty�s piece de resistance. the bvks are a dark olive with rec recoil stripping guides. i am a big fan of these guides. the rods feature a nice carbon fiber reel seat, also something that i am a big fan of. these two features in addition to ultra light chromium-impregnated stainless steel snake guides and some secret �new� materials make the bvk extremely light. the rod build is scarily similar to the custom original glx rods that i had my buddy dean build for me. those glxs are my favorite rods of all time. sean had told me that he lined one up and was impressed by how easily the bvk cast. so i took a break from the two handed madness i�ve been caught up in lately and fished the 7wt. bvk for the past two days. the first day i lined it up with a 7wt. rio outbound short. my first impression was simply... wow. i�m always yapping about �fast with feel� and the bvk is exactly that. the rod has none of what i call "clunkyness" that is found in all lower priced rods as well as some midpriced rods. the action was crisp and the over all feel was excellent. it's one of those rods that you find yourself stripping in too fast just so you can cast it again. laser tight loops were formed with the greatest of ease and i was conking extremely long casts with one false cast. i caught a few bones with it that day and it handled like a champ. then yesterday i lined it up with a 7wt. 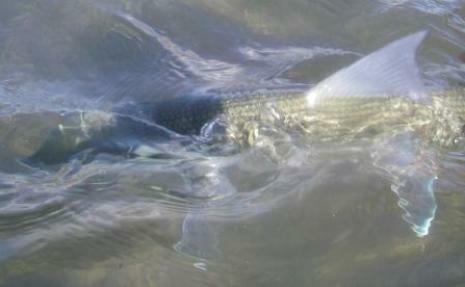 scientific anglers mastery bonefiish line and took it out for a little sight fishing... it performed flawlessly. deadly accurate close in and just for fun i blew out a few ridiculong casts too. i just couldn't resist. i didn�t land any fish yesterday but i did straight up break 20lb fluorocarbon while trying to hold a big boy from going over the edge a testament to the rods strength. simply put the bvk is an awesome rod and this (for those not in the know) is coming from a guy who is staunchly against any fly fishing equipment made overseas. granted i�ve only spent two days on the water with it and i haven�t tried the other line sizes yet, but from what i�ve seen, i would highly recommend this rod to anyone getting into fly fishing, on a budget, or looking to fill in the gaps in their arsenal with an extremely high performance rod. by far the best rod i�ve ever casted in this price range and i�ve casted a lot. i have always said that if you blind folded me and let me cast any lower price point rod and a higher end rod i would be able to tell the difference but i gotta say with the bvk... i don�t know. it really is that good. greg "pops" honbo has been incognitus for a while busy with the mister and his new job. 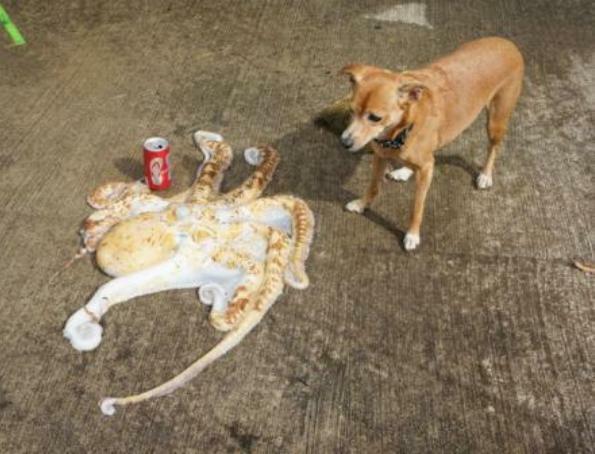 he did find time to get out on the bay and checked in with this monster tako (octopus). eh greg, where's my poki? very ambitious little critter, this guys gonna grow up to be a biter. meanwhile nwff guide e.t. has been out and about showin' folks how it's done. the tfo bvk is a serious rod and it takes a serious rod for serious... good times. 1. hope for the best but expect the worse. take it from me, good words to live all of your life by. go in with that attitude and you�ll never be surprised in a bad way. 2. fish whenever you can for as long as you can. don�t worry about the tide or weather. the guys that pound are the ones that catch fish. the ones that study tides and weather and try to get out on the �good� days usually pigeon hole themselves and never see the whole picture and are limited in what they have confidence in. yes, some tides and weather are better than others but it is not as absolute as many think. over the years i have had just as many fish filled days on so called bad tide or weather days as i have had �nuttings� on ideal (at least looking) days. generally speaking days in the winter are frequently not ideal so time on the water is crucial to success. 3. notice the differences and adjust. 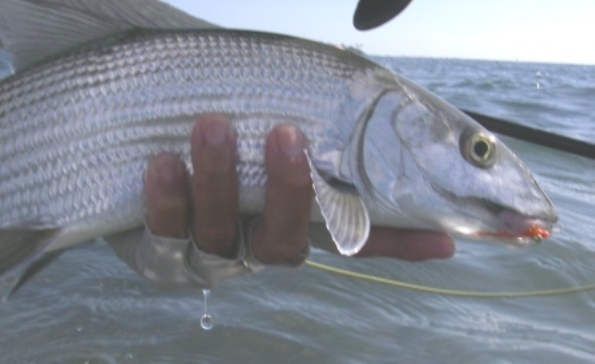 there are many subtle differences in the winter that create big differences in fish behavior and how to get at them. the sun is going to get lower and lower as winter progresses. this will affect the directions that fish can be spotted as well as the distance that you scan the water and should affect how you fish. 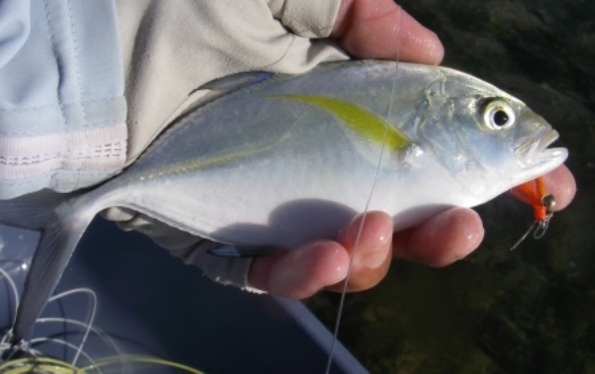 on cooler days fish are less active. the fish i caught this past week were kind of slow and sluggish, what i call �squishy�. in these situations try slowing down your presentations to a crawl as these fish are less likely to chase and pounce on things. if you are doing the same thing in the winter as you do in the summer, you may have a tough road ahead and may want to consider changing your plan of attack. 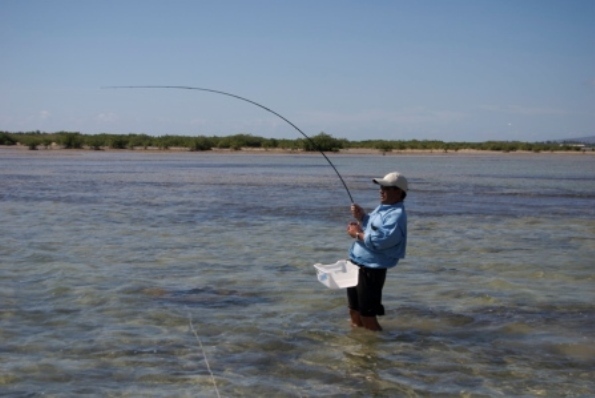 4. pay close attention to your gear and how you are fishing. this should be all the time but i usually start paying closer attention to things when the winter months roll around and i know that one fish could quite possibly be it for the day or maybe even the week. change leaders often. i have just started using a fresh leader every time out whether i get fish with it or not. make sure that your reel is in good shape. sharpen hooks and get rid of those that are rusting. when on the water pay extra close attention to presentations. 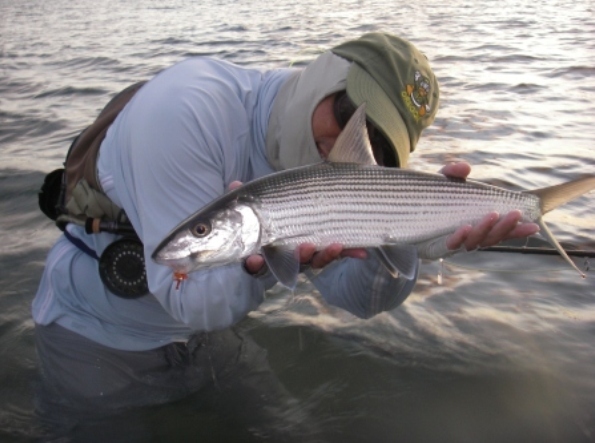 try to envision what your fly looks like in the water on every cast and with every strip. this will help you notice more of the subtle changes (mentioned above) in wind, currents, and bottom make up that do occur in the winter. if you are prone to throwing wind knots, make sure you check your leader often and get those out. like i said these are all things you should do all year but it all just gets magnified in the winter. fish like your life depends on it. 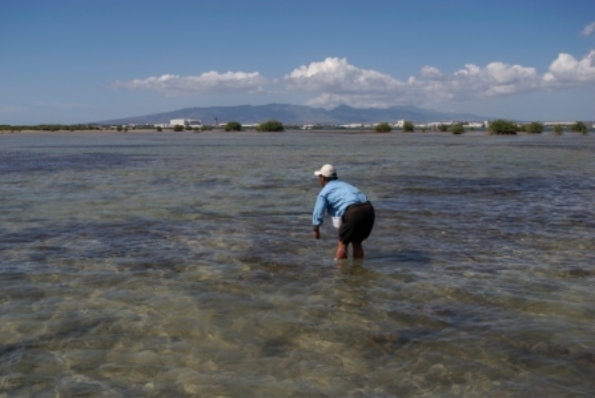 there�s nothing quite like losing the only fish you hook all day. 5. enjoy the difference and the challenge. i love tough fishing. the promise of tons of fish just doesn�t get me all that excited. i look foreword to winter and the changes and challenges that it can present. 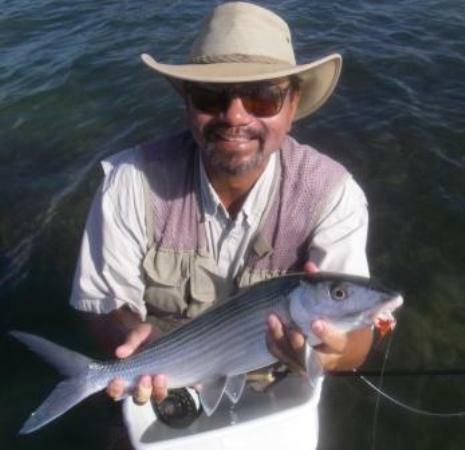 here in hawaii our fly fishing opportunities are limited at best, so any kind of change to the same ole� same ole� (that doesn�t involve an airplane) is always welcomed by me. but i wouldn�t hold my breath. pounded ke'ehi hard all day with my meiser switch rod. the flat was a ghost town on that day but i did manage this one "day saver". then at hi kai the winds were sustained 15 to 25mph with gusts up to 40. needless to say, the sea was very angry. but it was no match for the deathstar (sage 7126 tcx) and a 570gr airflo skagit compact. i pounded until i found a pod of rats and got a few of them before they vacated the area. doug lum and his day saver. winter fishing was in full force this week and only time will tell what's in store for us in the upcoming months. for sure there will be more days when we'll have to "steelhead up" in the eternal quest for good times.